Error: Is part of the game or the website not functioning like normal due to a bug? Solution: Let us know so we can fix it as soon as possible! Is it a bug or a technical issue? It's very easy to get these two mixed up so make sure that you're handling the issue the right way. Anything that is preventing you from being able to load, or play any Jagex products. If you have encountered a Technical issue head to Installation, Performance or Graphics support for a solution. Any piece of broken code that stops the game or website working as it should. If you think you've found a bug let us know in game! If you see another player involved in bug abuse, you can also follow the below steps to let us know, please include the character names involved. If you're submitting a Lost Items claim or requesting a Roll Back please also submit a Bug Report so we can investigate. Click on the report flag found on the chat box. 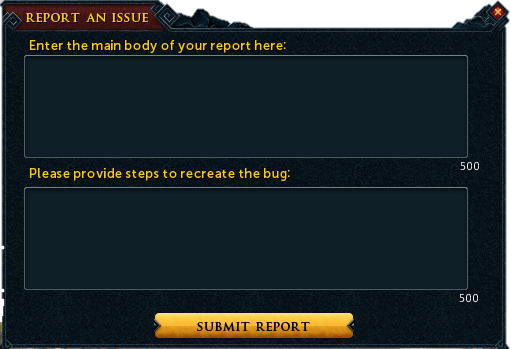 Select the 'Report a bug' option. In the first text box, enter as much detail about the bug as possible including what's happened and where. In the second text box, enter any steps that we can take to reproduce the issue you have found. Press the 'Submit report' button to send the report to us so we can review it. Right click on the 'Report' button found on the chat box. 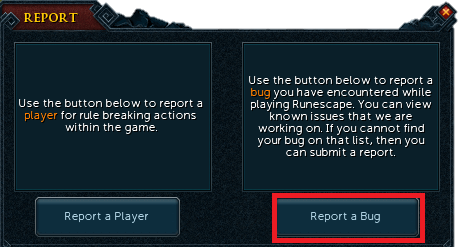 Select the 'Report game bug' option. Submitted the report - what's next? Our QA team aren't able to respond directly to bug reports. If the bug is confirmed, a fix will be worked on. Keep an eye on upcoming patch notes for the fix or join in the discussion in the Recent Game Updates forum. Can't get into game to submit a report. 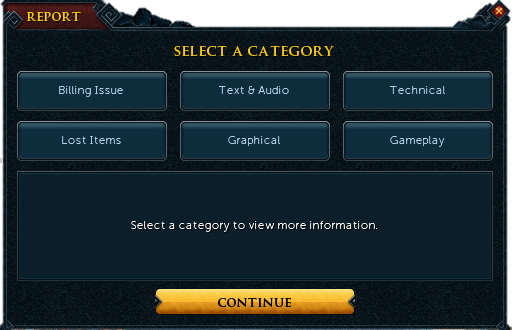 If you can't log into RuneScape, or load the game, check out some solutions to common client issues or issues playing in your web browser.